I've been a singer ever since I was a kid. Growing up, I always knew that I wanted to sing. I wanted to be Elvis (my dad was a HUGE Elvis Presley fan. He practically raised me on his music and early TV appearances). As I got older, I could never find someone to accompany me, and let me just sing. So I learned how to play guitar. I'd heard (and seen in the movies) that girls liked guitars... and they really seemed to like guitar players. Of course, what I didn't realize, was that those guitar players were famous, and had much more self-confidence than I did (or still do, to be 100% honest). So, my quest to meet girls kinda failed. After a few years of playing, (and seeing some improvement) I thought to myself, "Hmmm... Maybe I could get paid for this!". So I started going to local Open Mic nights and learning how to perform in front of an audience (there are recordings... No, I won't be sharing them). I slowly built up my show, and learned enough songs to put together one full set. And then it finally happened: I was asked to play a showcase! FOR MONEY! 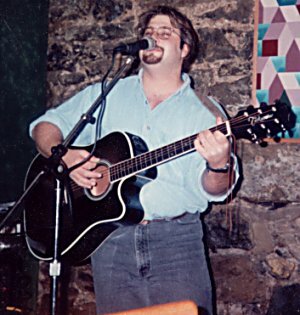 So on May 26, 1993, at a small bar in Easton, PA, I made my professional debut. My friends came out (all 3 or 4 of them) to support me. I was one of three acts on the bill, and I was paid the princely sum of $25.00. I was in heaven! And, I was terrible. But, I was finally a "real" professional musician. That's the best part feeling of all. That is heaven. Until next time... Thanks for reading, listening, and being here!